November 15 marks America Recycles Day, a day where people across the country pledge to keep America beautiful and commit to a more focused effort to recycle. Did you know, the national recycling rate has increased over the past 30 years to a current rate of 34%? Imagine what impact can be achieved if this rate continues to grow. 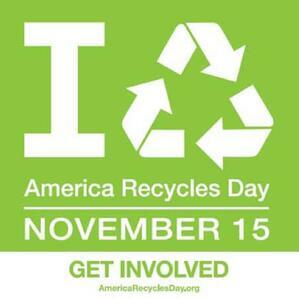 One way that this can be achieved is by taking the America Recycles Day pledge. So far, more than 77,000 people have completed it. Click HERE to join them. Another way to make an impact - find a recycling center near you so that the next time you have materials to recycle, you'll know where to go. Click HERE to find your nearest center. Consumers and brand owners alike are becoming increasingly aware of the impact they can have in preserving the environment. As a result, products that offer more sustainable packaging, including those made with PCR, are viewed more favorably among consumers and brands. Post consumer resin (PCR) is the recycled product of discarded packaging. Plastic materials are gathered and sent through a proprietary process to produce plastic resin pellets. Utilizing PCR has the potential to keep billions of tons of plastic out of landfills. Reusing resin as PCR does not require further depletion of new fossil fuels. Post-consumer plastics such as PET and HDPE PCR have already been processed from a fossil fuel to plastic. Additionally, utilizing PCR has the potential to reduce greenhouse emissions by nearly 60%. Therefore, Mold-Rite Plastics has recently completed PCR molding trials on several MRP product lines including disc tops, large diameter CRC’s and Flappers as well as jars. Positive results from this testing have lead MRP to begin the process of adding PCR to our resin offerings. PCR is especially suitable for customers/markets with a strong pursuit of sustainable options and a resolute sustainability platform, particularly personal care, household chemicals and Cannabis. To learn more about MRP’s PCR offerings, click below.